Vijay Mallya: I'm very pleased with the last couple of races. As in the first part of the season, we've recaptured our form and maximised car performance. We've managed the last two races very well and taken a different approach with the strategy. In Abu Dhabi we were the only team to achieve a one-stop race with both cars, which was a bold decision. We managed to pull off the perfect strategy and picked up the rewards. VM: We're certainly in better shape, but will never take anything for granted. We've scored 15 points in two races and we now have some breathing space behind us. But we won't change our approach heading to Austin. We will go there focussed on closing the gap to fifth place, which is just 18 points. What are your expectations for the United States Grand Prix? VM: I think everybody was impressed by our first visit to Austin last year. The race was a real success and it's great to see the interest from such an important market. We were in the points last year and we go there determined to get some more this year. 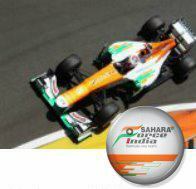 Paul Di Resta: These results are a massive boost for everyone at Sahara Force India. In Abu Dhabi we played the long game and the strategy was spot on. We focussed more on the race set-up rather than one-lap pace and that was the key to making the one-stop strategy work. We've also got the car into the window that gives more consistency and confidence. Everything came together and it was a great team performance. Looking ahead to Austin, are you excited to be going back to the United States? PdiR: It's great to have a race there, especially at such an impressive facility. I still remember the huge crowd that came to the race last year and the amazing atmosphere. The place was absolutely packed and the whole city was very enthusiastic about Formula One. We go there with high hopes and will try and build on the performance of Abu Dhabi. Which part of the track do you enjoy the most? PdiR: Sector one stands out for me. It's very similar to the Maggots and Becketts sequence at Silverstone and the fast chicanes work the car and tyres really hard. It's a very enjoyable part of the lap and those corners really show you the potential of a Formula One car. The rest of the lap is quite open with a great flow. A lot of the corners are off-camber, too, which adds another challenge. Adrian, how are you feeling after two races in the points? Adrian Sutil: It's good to be scoring points again. It's not been easy and we've taken some brave decisions with the strategy and that paid us back. But at the same time you always want to improve and there are still some areas with the car balance where we can make some gains. Hopefully we can make some progress so that I feel more comfortable in Austin. Will this be your first visit to Austin? AS: Yes, but I've spent time in America before. I've been to a few of the big cities: New York, Los Angeles and Miami, but never to Texas. I hear it's a beautiful place with a lot happening so it sounds like a great location. I've heard lots of good things about the Circuit of The Americas, too. You've driven the track on a simulator. What did you think of the layout? AS: It's a very unusual lap with a big variation of corners. The first sector is interesting with so many turns one after the other and it looks like there are some nice high-speed corners. The feedback I've heard is very positive and everyone says it's smooth and enjoyable to drive. From what I've seen it appears to be one of the better new generation tracks so I'm looking forward to getting there and trying it for myself.